We aim to go beyond the standard fare of fun activities available in Calgary to provide an environment that really lets you laugh, learn and connect. We’re honoured to be so highly regarded by our clientele. What people say is most important to us providing a great experience. Thank you for your feedback and your testimonials. James and I had an AMAZING time on Saturday for Valentine’s Day. Everything went smoothly and was so fun! The food was incredible, we couldn’t get over it all. The painting was so fun, I hope you have your lovely artists come up with a few more that can be done as a couple! We would definitely come back for that. Thanks so much for our best Valentine's Day ever! How amazing and different all the painting were. It was so much fun and a great way to spend an evening with friends. We had a FABULOUS time on Saturday night. Thank you for having us!! We can’t wait to come back again! Lots of fun and you learn ‘a bit about art. Good social event. My girlfriends and I do a monthly ‘girls night out’ and we’re excited to try your new place! It's not something I thought I could do or enjoy. I had a great time and love my painting! I even have it hung in my house. Wouldn't have even gone if it wasn't my friend’s birthday. Enjoyed the experience and was pretty impressed with the food too. Definitely coming back. It was so laid back, welcoming and so much fun. Friendly, no pressure, fun experience. Will definitely be back. We had an absolute blast! It was so much fun to get everyone out of the rink and into something completely different! It was more than I expected as I got a decent painting out of it - I honestly did not think it was possible to do 🙂 All I have heard from everyone else is how much fun they had. Thanks again for the great time! I will be back! You are going to LOVE the experience. No place here to think or worry. It’s all about forgetting the stress of the day and being totally focused on making art. Seriously?! We can paint and drink wine all in one. Loving it. I have to take this opportunity to express my gratitude to you and your lovely team for facilitating such a wonderful evening. Not only have I found a new interest (besides my wonderful date; painting) I also managed to score huge points in the categories of creativity, spontaneity and overall a great date idea. I confess that I merely had a small part in the aforementioned categories. Your team did most of the heavy lifting as it were. Thank you again for accommodating Shannon and myself on such short notice. We will definitely be back and it goes without saying, raving to everyone we come in contact with how lovely an experience we had! An opportunity to let go of perfectionism. 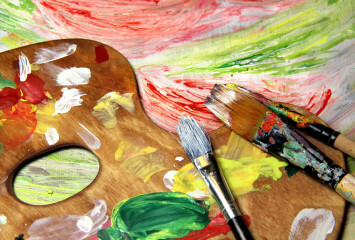 Step into the world of Vin Gogh and unleash your inner artist. Your artist staff is amazing. I had no idea that my painting was possible. I’m so excited to show my family what I painted. We had an amazing time on Saturday at Vin Gogh's !! What an experience that was , especially for someone who could barely even draw a stickman ! On a whole , I was very proud of my painting and would like nothing better than to take lessons and learn the basics of painting. My favorite part was the 'group painting'and being able to see each of the other paintings in stages. We had our company Christmas party at Vin Gogh this Saturday. I was extremely skeptical that this venue would not work very well for a company party, especially given my aversion to painting and crafts of any kind. Wow, I could not have been more wrong. We could tell from the moment that we walked in the door that this was going to be a lot of fun. And throughout the evening it proved to be a great time for all involved. A number of our employees commented that this was the most fun that they had experienced at one of our Christmas Parties for a long time (and we have had some doozers!!). The owner met us and was very gracious. The servers were very professional, prompt, and friendly. The painting instructor Becky was GREAT! And, the food was delicious! I cannot say enough positive things about our event. Thanks!! Easy, fun, interactive. Great team building or other get togethers. 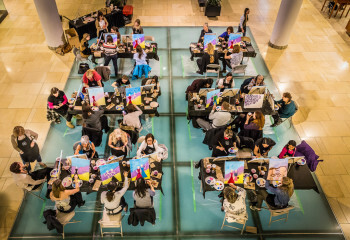 A very fun thing to do for team building or girls night out. No experience necessary and a great selection of wine. The Valentine's Day event was quite a great success! We had a great time. My favourite part was the painting and I really enjoyed working collaboratively with Lindsay, but also doing my own thing on my canvas. I feel it was a perfect metaphor for relationships. You are both independent people that do your own thing sometimes, but at the end of the day you are a team and the things you do end up creating a masterpiece of life and love. Brilliant idea. Tired of dinner and a movie for date night. Will be bringing my husband for sure. Fun evening and at the end you are amazed by what you have done. Great food, great atmosphere and a wonderful experience! I loved, loved, loved the whole thing. I didn't believe you could make it simple enough for even me to paint, but you somehow did it. I love my picture and have got lots of compliments. I honestly can't think of a thing to change. Love the food and drink selection and the instructors were so helpful. I've already convinced one friend to try it and hope to get a group for girls night. I would love it as a date night too. I’m going crazy waiting. Can’t wait to paint and sip at Vin Gogh. Can’t wait for you to open. We do a monthly client appreciation event and want to host one at your new studio. Great evening, spontaneous fun and no experience necessary. Laugh and learn. We had such a great time I am definitely coming back next month with my husband and I am telling everyone about your place. Thanks again for such a great evening! I did one of these last year. I have no painting experience at all. It was fun, social and easy. Quite happy with my little masterpiece. A night like no other – fresh, fun and fantastic! So much fun! Take a cab. Have some belly laughs and find your creative muse. It’s a great ‘girls night out’. Wine & Art. A night out. Awesome!